After a utterly barnstorming stage, the GC men will surely be taking it easy on Stage 14 and this looks set for a breakaway win from one of the puncheurs, but with the Top 8 only separated by 2 minutes, any opportunity that arises will be taken. Looking at the profile, this is very much a stage of two halves, the first section (around 70kms) is predominantly flat and should see a break form relatively easily. 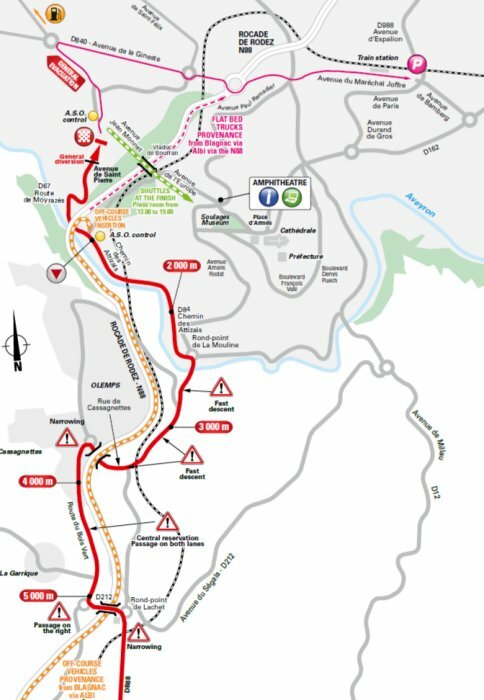 The final 100kms cover rolling roads, which feature two cat 3 climbs – the Côte du viaduc du Viaur and Côte de Centrès, both averaging 7%. This is as close to a spring classic as you’ll get in the Tour. Van Avermaet has been very quiet during this Tour. His teammate, Porte, scuppered his chance for the win on stage 3 and he will have had this stage marked down since the route was announced. He has continued the success he had in 2016 this season, taking his first Monument at Paris-Roubaix. With Sagan no longer in the race he will be the favourite. Matthews, on the other hand, has been very animated throughout the race, contesting sprint finishes and also putting in some huge efforts to get over the climbs to take the points on offer at the intermediate sprints. All of this work will have sapped his reserves, so although we expect him to be up there at the finish, though he may not have the final kick to take the win. Another Belgian who had a great spring was Gilbert. He has looked like the rider he was in 2011, which was also the one and only time that he won a Tour stage. A win here would complete the Phil Gil renaissance. His teammate Stybar could also go well, but he hasn’t really shown the form he had a few seasons ago. Quicksteps GC man, Martin would also suit this type of finish, but his other GC rivals are unlikely to let him get away in a break to fight for the win.